I feel as though pears are often overlooked as a fall fruit. Poached pears in vanilla ice cream with a bit of cinnamon has always been a favorite of mine. It has been a tradition to make them up at my cabin in the winter. Snowed in, snuggling down to a nice warm fire with the smell of cinnamon and pears will always feel like home to me. I wanted to transfer that idea into a savory cocktail. I have to say the most exciting part of coming up with this cocktail was the syrup. I knew the flavors that I wanted to combine but I wasn’t sure how to get them all into one glass. The result is phenomenal; it’s light and delicate without compromising depth in flavors. Combine all ingredients in a beaker with ice. Stir well. Fine strain into a chilled martini glass. 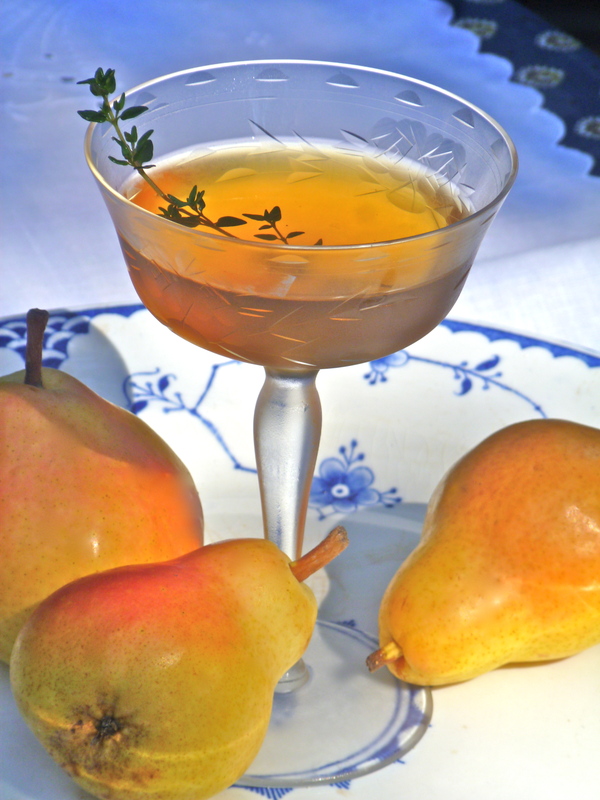 Garnish with a thyme sprig… enjoy. Combine all ingredients and bring to a boil. Turn down heat and let simmer until liquid has reduced by half. Cover in an airtight container and let sit over night. Fine strain thyme, orange, and pepper out into a clean air tight container.